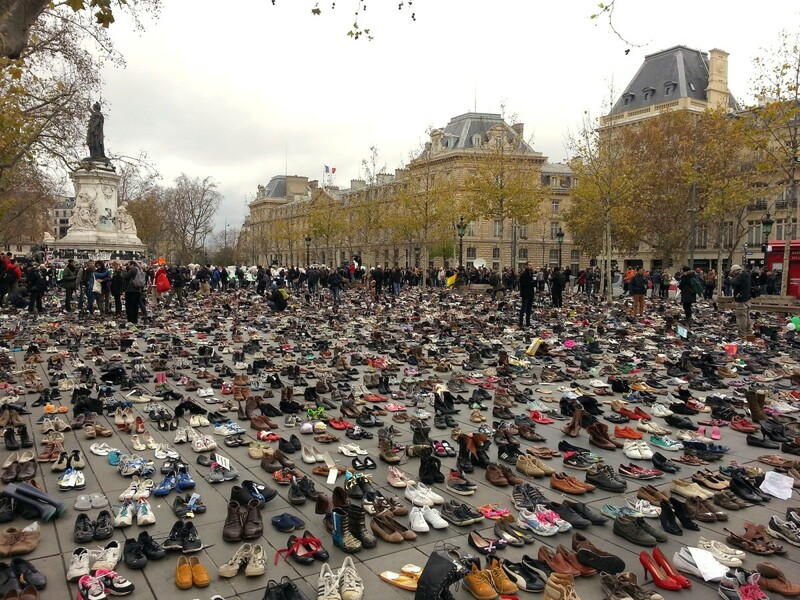 When the government said they couldn’t march, activists covered the Place de la République with shoes—and an estimated 10,000 people gathered to form a human chain. There was no marching in Paris today. Today was supposed to be all about marching—200,000 activists had planned to converge on the Place de la République, in solidarity with fellow demonstrators around the globe. 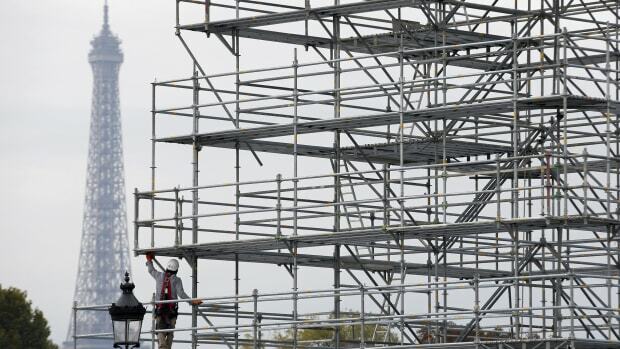 The scheme was peaceful but massive and would have been a nightmare for security services, and following attacks in the city on November 13, the government instituted emergency measures that included certain restrictions on the freedom to assemble. 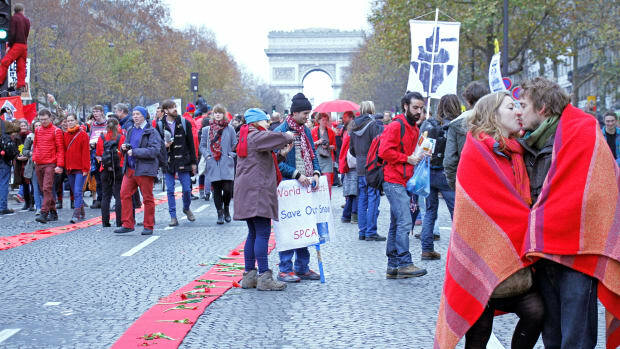 Instead, Avaaz, the well-connected international NGO that organized the original rally, staged a simple workaround: The marchers were banned, sure—but Hollande never said anything about their shoes. So, beginning before dawn, activists laid more than 20,000 shoes in more or less linear rows and columns full across this wide, stately convergence of wide, stately avenues. There were work shoes and tiny ballerina’s slippers and high equestrian boots and even the occasional swimming flipper. (Ominous.) 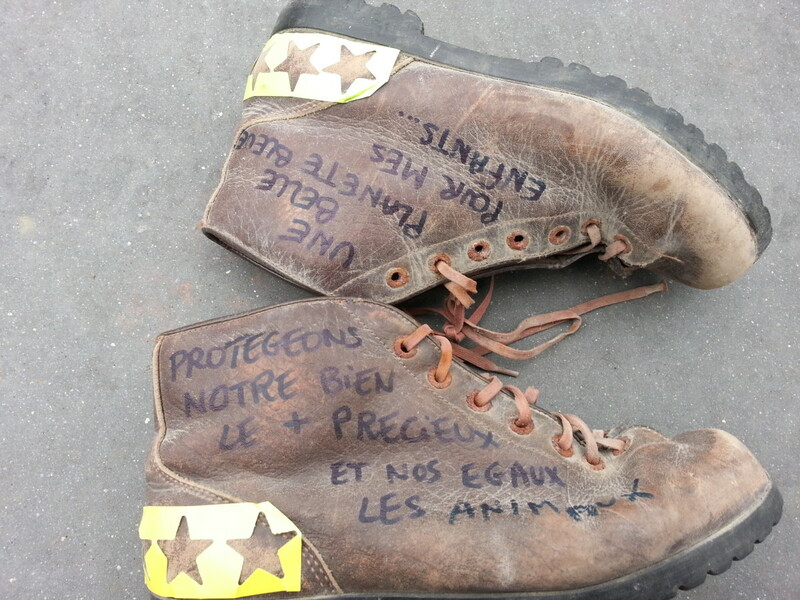 Eloi—age 11, according to his note—had donated sandals, and Marie—age 41—her sneakers. Among these sat a pair of the Pope’s finest, donated to express his fellowship with those protesting climate change, and rebuking the laws that prevented the march. Smaller groups congregated here and there between the islands of shoes, but mainly people kept to the sides, even the journalists. By one pair of boots painted with slogans (“a blue earth for my children!”), a man dressed as “Sustaina Claus” chatted with a man who had walked here from Rome. A stern-faced woman led a smallish group of women through a phalanx of television cameramen, clearing a path: "Ladies and gentlemen, the angels are following me. If you block me, you block the angels." The women behind her moved somberly, clad in white and with silken feathery wings that had wilted only a little. They held signs, one of which bore their name in calligraphy—Climate Guardians. 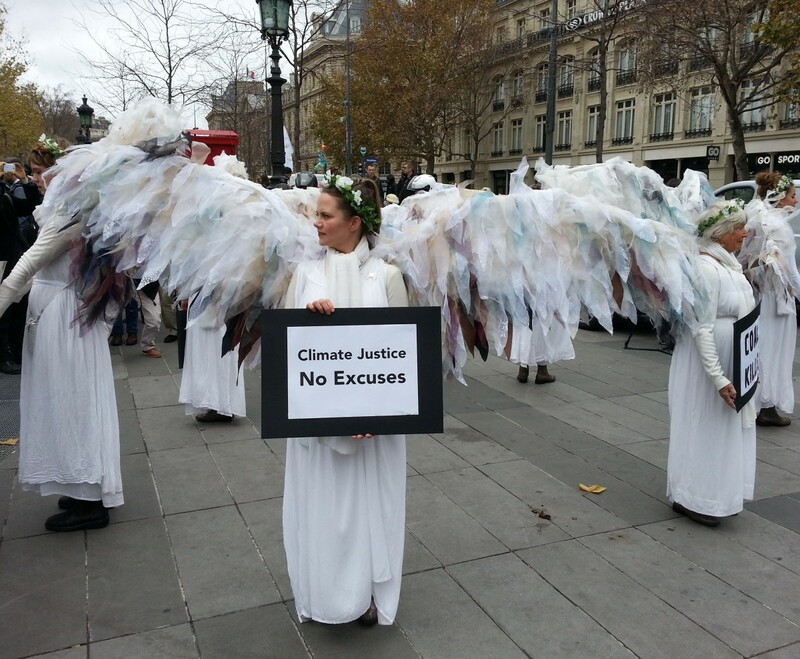 The adherents who moved in their orbit called them the “Climate Angels.” The angels spoke as little as possible, but then everyone spoke as little as possible. People tended to step gingerly between the shoes, as though the invisible owners had died in a noble fight. An unspoken, transferred mourning: MEME PAS PEUR, read a sign slung across the monument of the République. No fear, not even now. I’m dreading the day that I have to apologize to my children and grandchildren. I’ll have to apologize for taking this earth for granted, always taking and never giving. [one line meticulously blacked out] Telling them stories about animals we used to have, about how we used to have butterflies and how trees grew in the ground, we used to have clean water and foods that didn’t just come in a can. How the air we used to breath would actually help our boddies not kill them. I watched the happy throng who joined hands to create a “human chain,” the first portion of which stretched from the Place down the Boulevard Voltaire. Their hands were linked, some fingers interlaced. There was singing and laughing and exchanging of names in various languages, many groups merely chanting “ECOUTEZ” (“listen!”), others hooting through makeshift blue megaphones. “It’s an alternate form of protest,” a friend told me, referring to the megaphones. She said Parisians were also putting stereos so they faced out of windows and generally making noises in unexpected ways—another response to the no-marching orders. We could see the Bataclan, and a café where, two weeks ago, a suicide bomber had placed his order and detonated his vest. The cheerfulness of those people holding hands seemed a kind of conscious rebuke to all that hate. Nonetheless, it bears remembering that French security services in Rouens, Paris, Lyons, and elsewhere held at least two dozen climate activists under house arrest in previous days, and even before that climate activists were worried about losing their voice at the convention, just when the world seemed ready to listen. 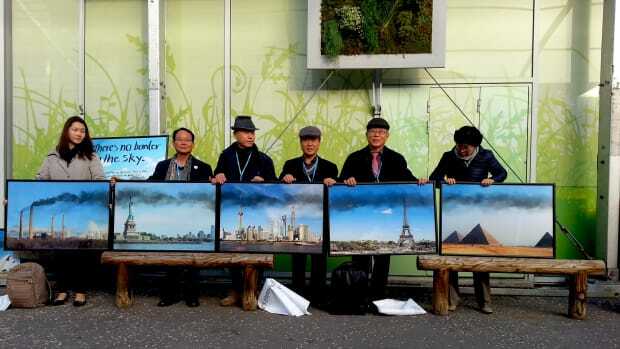 At the street level, it has become clear that climate activists are not collateral to the current security crackdown; they are one of its central targets. Getting violent once you recognize the con does nothing but lend further political cover to agents of suppression. When I returned to the hotel, I flipped on the news and saw two things: a report about coastal erosion visible from Calais, interrupted by a word about the brief clash between protesters and police in the Place de la République. The reporter began by assuring the anchor that these memorial-pillagers constituted a fringe, and a teensy minority, of the day’s many manifestants. He was right, and she seemed reassured. Most of the people I saw on the street seemed to think it had been anticlimactic. 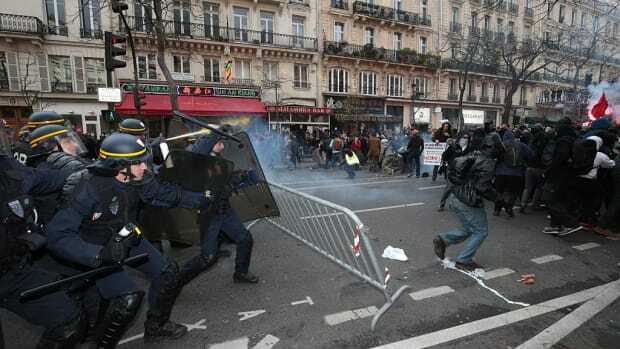 In Paris there’s a high bar for a lot of things, including revolution. “Catastrophic Consequences of Climate Change” is Pacific Standard&apos;s year-long investigation into the devastating effects of climate change—and how scholars, legislators, and citizen-activists can help stave off its most dire consequences. Senior Editor Ted Scheinman previously taught courses in satire, poetry, and journalism at the University of North Carolina–Chapel Hill. Before that, he was an editor at the Washington City Paper. On Saturday, activists stood in the cold collecting four tons of donated shoes. On Sunday, the anarchists showed up. 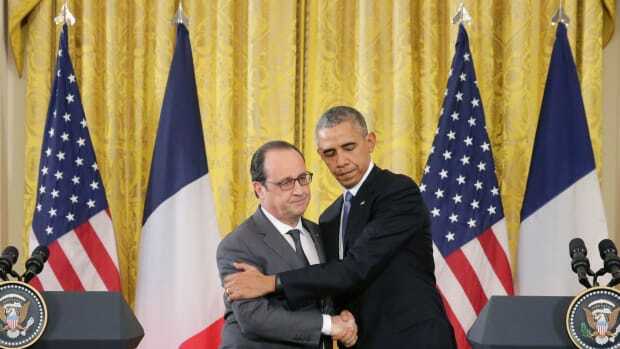 What Is Happening in Paris, and What Do All These Acronyms Mean? At COP21, the UNFCCC will take the findings of the IPCC, assess the INDCs of 195 signatory countries, and help LDCs limit their GHGs. Here is what all of that means. 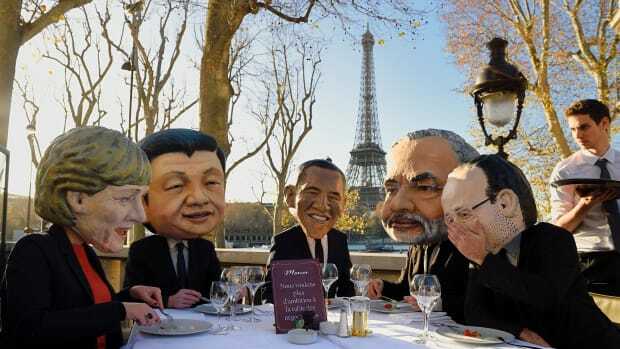 The climate summit emerges from a rocky week with a new text. Negotiations have been transparent and equitable—or maybe opaque and grossly unbalanced. Welcome to the COP-Spin Zone. From New York to New Delhi, citizens and activists gathered in astonishing numbers at more than 2,000 events around the globe. After dancing around the margins of the COP, on December 12, civil society finally got its day in the spotlight. It's not just about rebuking the terrorists—it's about making sure we don't let climate change create more of them.